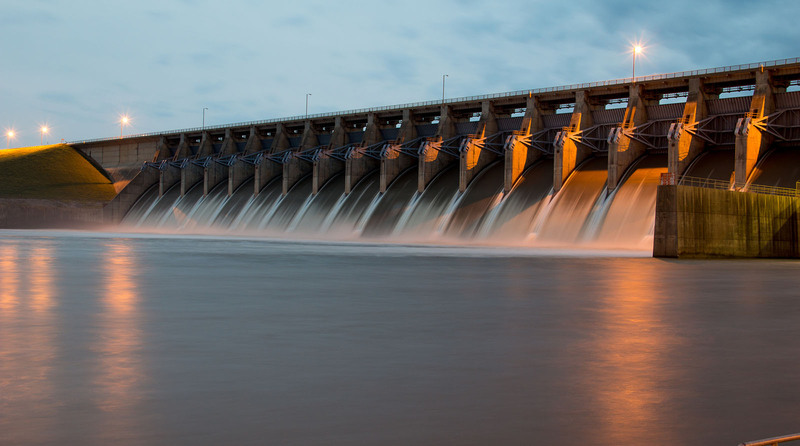 The Keystone Dam in Oklahoma with all the gates open. The U.S. Senate passed a comprehensive water infrastructure package Oct. 10 to authorize the Water Resources Development Act (WRDA) by a vote of 99-1. The NACo-supported, bipartisan legislation now heads to the president’s desk for his signature. This is the third WRDA bill passed in the past six years, moving WRDA back to a two-year authorization cycle. The bill, America’s Water Infrastructure Act of 2018 (S. 3021), was pieced together from a previously passed House WRDA package (H.R. 8) and a Senate WRDA bill (S. 2800). S. 2800 was unable to move independently through the Senate due to a hold by Sen. Richard Burr (R-N.C.) on an unrelated issue — reauthorization of the Land and Water Conservation Fund, which expired at the end of September. As a workaround, committee staff on both sides of the aisle negotiated a new bipartisan bill which was passed by the U.S. House of Representatives last month. The compromise version would authorize a wide variety of water resource projects and policies administered by the U.S. Army Corps of Engineers (Army Corps) for navigation, flood control, hydropower, recreation, ports, harbors, inland waterways, water supply and emergency management. As major owners and operators of much of this infrastructure, counties are directly impacted by the policies and projects authorized in WRDA. Most notably for counties, the WRDA legislation includes numerous provisions that would require the Army Corps to consult with impacted stakeholders, including local governments. The bill would also authorize $6.1 billion for 12 Army Corps projects and 65 feasibility studies for potential projects. It also includes $4.4 billion for the U.S. Environmental Protection Agency’s (EPA) Drinking Water State Revolving Fund program, which provides funds to states and utilities to improve drinking water infrastructure. Requiring the Army Corps to develop a process to consult with stakeholders, including states and local governments, on future and pending WRDA projects, annual district budgets, deauthorized projects and guidance documents. Authorizing study of the existing cost-benefit analyses used by the Army Corps and the White House Office of Management and Budget to determine which water resource projects are submitted to Congress for WRDA authorization. Allowing communities to work with the Army Corps on decertified levees. The bill would allow the Army Corps to provide technical assistance, on a reimbursable basis, to local governments that own levees not accredited by the Federal Emergency Management Agency. Decertified levees lead to higher National Flood Insurance Program costs for homeowners. This provision would authorize the Army Corps to identify barriers to certification. Increasing the focus on natural and nature-based features. For projects in an aquatic ecosystem or estuary, the Army Corps could consider and include natural and nature-based features into projects. Increasing the focus on renewable energy projects. The bill would require the Army Corps to identify dams that can be used for hydropower and ports that can be used for wind energy. This would increase the use of renewable energy nationwide. Requiring drinking water systems with more than 3,300 users to undertake risk assessment and emergency response plans to assess the risk to and resilience of its system from both natural and manmade hazards. Absent from the legislation are provisions addressing the Harbor Maintenance Trust Fund (HMTF) and EPA’s Integrated Planning (IP) Framework, which NACo had advocated. HMTF is a tax levied against importers and domestic shippers using ports and harbors in coastal and Great Lakes areas. Even though the HMTF has a large surplus, only a portion of its total is appropriated by Congress every year for operations and maintenance in the nation’s harbors. The IP Framework, on the other hand, was designed to help communities struggling to comply with tighter Clean Water Act (CWA) requirements. IP would help communities prioritize CWA investments, while meeting CWA mandates and environmental goals. Congressional leaders have indicated a willingness to continue to work on HMTF and IP moving forward, separate from the WRDA 2018 bill. WRDA legislation is historically passed every two years. However, in recent years, Congress has only been able to enact three WRDA bills: in 2007, 2014 and 2016. WRDA currently has a backlog of nearly $100 billion worth of projects that have been authorized but have not yet received appropriations. The current WRDA legislation would be added to the list of projects awaiting congressional appropriations. NACo is encouraged by congressional efforts to move WRDA back to a two-year authorization cycle.